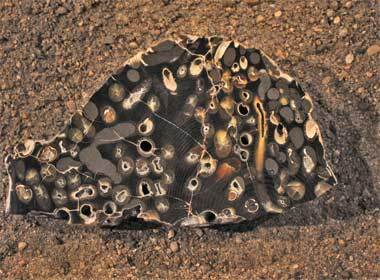 North Dakota Heritage Center exhibit: Teredo-bored petrified wood from Cannonball Formation, Morton County, ND; photo courtesy of North Dakota Geological Survey / Dept. of Paleontology (all rights reserved; used by permission). Teredo petrified wood is unique because of the "worming" of the original wood by the prehistoric teredo - a worm-shaped mollusk related to modern clams, mussels, and oysters. 60 to 80 million years ago during the Paleocene Epoch, the teredo was burrowing through trees growing near the edges of warm swamps in North Dakota. 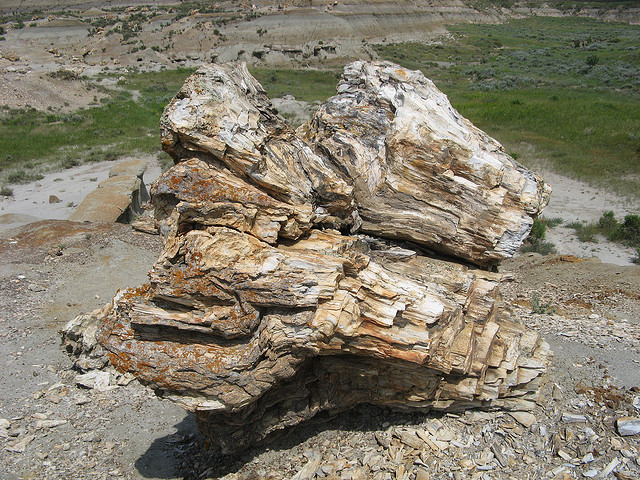 Large piece of petrified wood in the petrified forest; Teddy Roosevelt National Park, North Dakota: photo by Deron Staffen on Flickr (noncommercial use permitted with attribution / share alike).